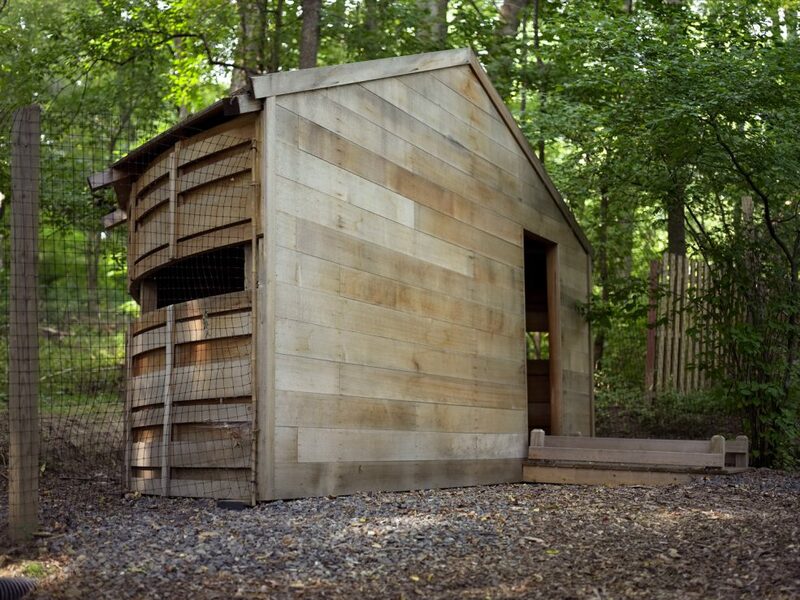 Thoreau’s Hut: Pine, cedar, recycled brick, flagstone, and stainless steel on concrete pad. Benches: Locust and stainless steel on concrete pads. Bird Blind: Cedar and stainless steel on concrete pad. Artist Ed Levine, through the Fairmount Park Art Association’s (now the Association for Public Art) program New•Land•Marks: public art, community, and the meaning of place, worked with the Pennypack Environmental Center Advisory Council to develop the public art project Embodying Thoreau: dwelling, sitting, watching for Pennypack Park in Northeast Philadelphia. 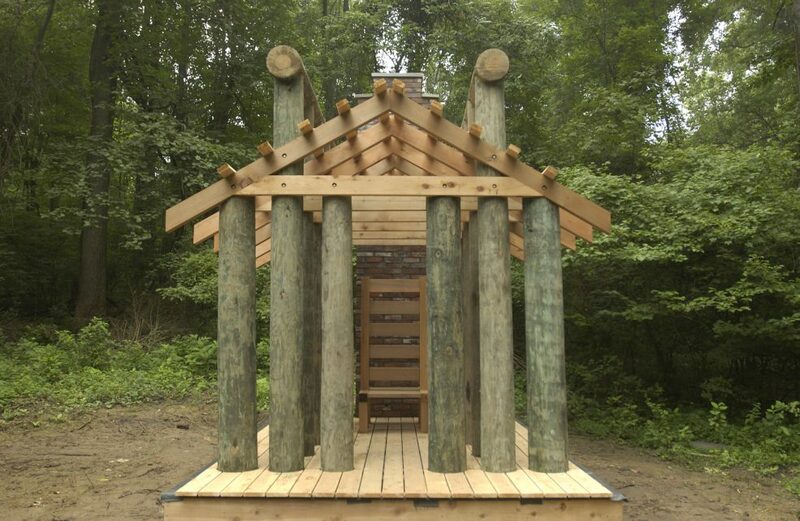 The project was inspired by the nineteenth-century author of Walden, Henry David Thoreau. 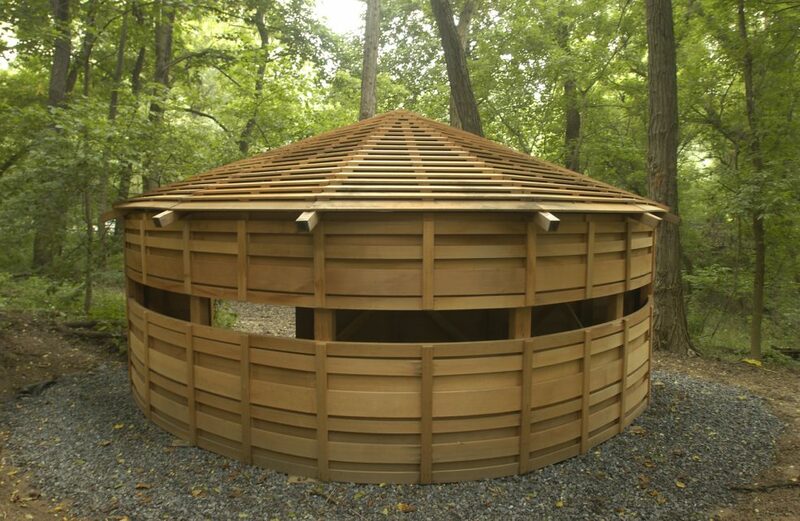 The first structure, “Thoreau’s Hut,” emphasizes humans’ place within the natural world. 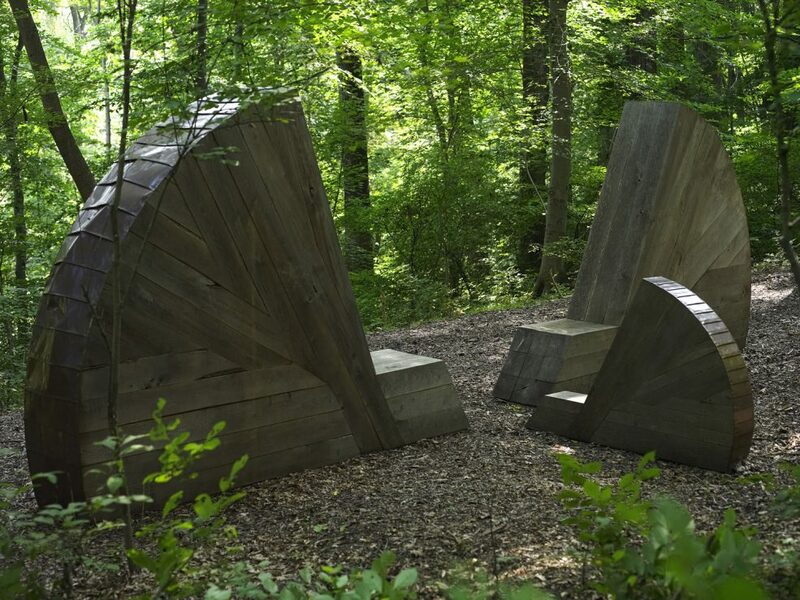 The artist was struck by the similarity between Thoreau’s values and those expressed by the park community: as Levine puts it, Thoreau “saw and expressed the dynamic relationship between culture and nature.” The project features a series of wooden structures, “between sculpture and architecture” that explore different aspects of humanity’s relationship to nature. 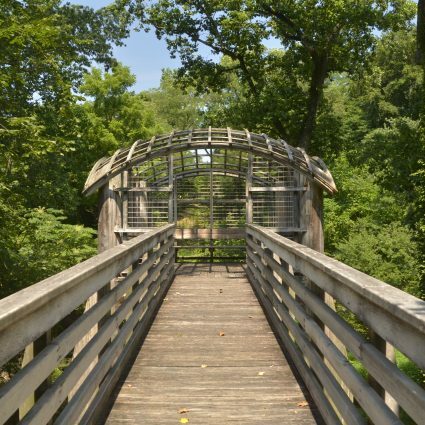 Located at different sites in the park, the structures are integrated into the educational programs of the Pennypack Environmental Center but also invite independent exploration. Via I-95: Take I-95 North to Cottman Avenue. Go West on Cottman to Roosevelt Boulevard Turn right onto Roosevelt Boulevard and continue until Rhawn Street. Turn left on Rhawn Street and continue for nine lights. Turn right on Verree Road. The Center will be on the left side of Verree Road. Via Roosevelt Boulevard/Route 1: Take the Roosevelt Boulevard to Rhawn Street (a couple minutes past Cottman Avenue.) Turn left on Rhawn Street and continue for nine lights. Turn right on Verree Road. The Center will be on the left side of Verree Road. Ed Levine has had a long and distinguished career as an artist, thinker, and educator. On his farm in Vermont, he has built a series of works that he calls Settlement: A conversation between art and water and the land. Settlement serves as a laboratory for his constructions, which use active water features to explore the physical and kinetic properties of air, landscape, and water. These structures heighten the viewer’s awareness of the interconnectedness of water with our lives and the landscape. Levine taught at the Massachusetts Institute of Technology, where he formerly served as director of the Visual Arts Program. He has exhibited in many museums and other venues throughout the United States, including the Southeastern Center for Contemporary Art in Winston-Salem, North Carolina; the Atlanta Arts Festival; the Artists Space in New York; and the Minneapolis College of Art and Design. His Floating Rocks: Looking into Time was commissioned for Pusan, Korea. 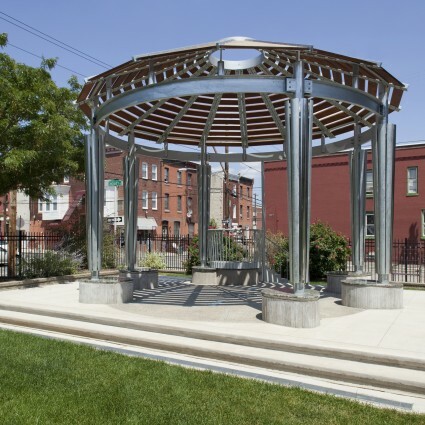 New•Land•Marks: public art, community, and the meaning of place was a program of the Fairmount Park Art Association (now the Association for Public Art) that brought together artists and community organizations to plan and create new works throughout Philadelphia. 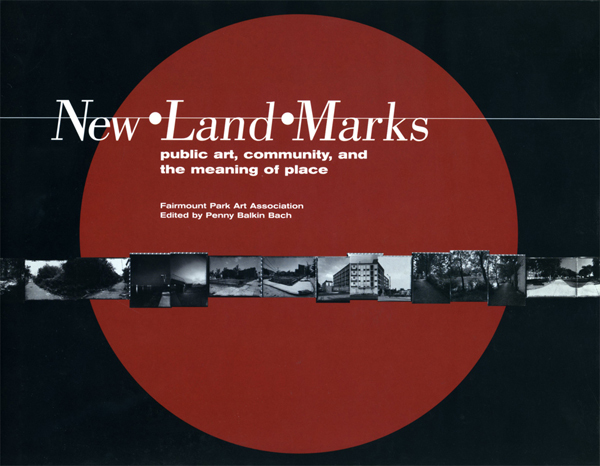 New•Land•Marks proposals incorporated public art into ongoing community development, urban greening, public amenities, and other revitalization initiatives. 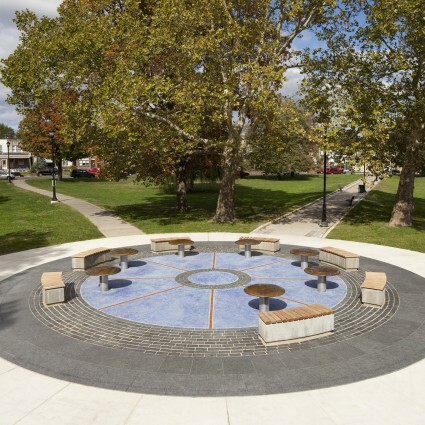 These efforts celebrated community identity, commemorated “untold” histories, and offered visionary, yet reasonable, ways to invigorate public spaces.